Bangkok PR is a full-service public relations consultancy. We provide the full suite of public relations services that help clients communicate and shape opinion. We survey and study stakeholder perceptions. Provide counsel on strategy. Draw up plans. Execute plans. 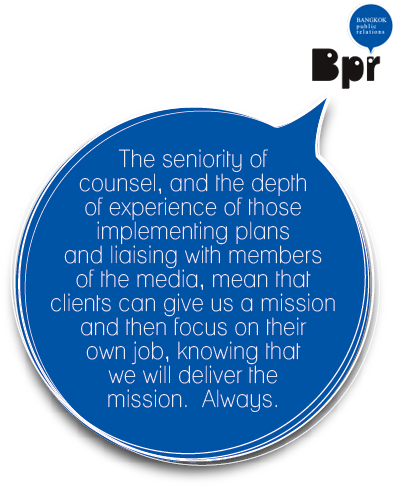 Implement media relations and government relations programmes, as well as other stakeholder relations programmes. Communicate and liaise with stakeholders, whether through direct contact or through traditional and online media channels. And we provide executive training on effective communications and media relations skills.